Don't Let This Happen To You!! 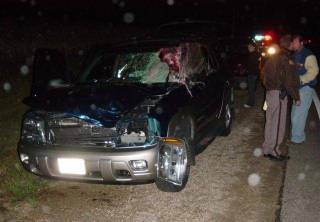 Be pro-active and read these deer car avoidance tips. They just might save your life. 1. Drive with caution when you see deer-crossing signs. The signs are posted in those locations because of established deer trails and deer feeding patterns. 2. When you are driving at night, use you high beam lights whenever possible. Try to drive within your headlights. 3. Be especially careful from dusk until midnight and before and after sunrise. Also be more careful in the fall and spring when deer are more active. 4. Brake firmly if you see a deer in the road, but do not swerve out of you lane. 5. Do not rely on deer whistles or other devices to keep deer from running into the road. 6. Wear your seat belt. 7. If you see one deer, slow down, there are probably others. IF YOU DO HIT A DEER, DO NOT TOUCH IT OR ATTEMPT TO MOVE IT! !